Runners get to soak up both the stark natural beauty of North Carolina’s Outer Banks as well as a piece of history — where the aviation industry quite literally took flight for the very first time — at the Flying Pirate Half Marathon & First Flight 5K, which take runners on a point-to-point route between the small coastal towns of Kitty Hawk and Nags Head. Students of early aviation history especially will be familiar with Kitty Hawk and nearby Kill Devil Hills, where the now-legendary brothers Wilbur and Orville Wright made the first successful powered flight over the beach here on these barrier islands just off the coast of North Carolina. Though that first flight lasted all of 12 seconds and lifted the plane only about 20 feet off the ground, later that same day the Wright brothers piloted additional flights that lasted nearly a full minute, and would of course help launch the birth of human-powered aviation and indeed, play a crucial role in helping connect the modern world. 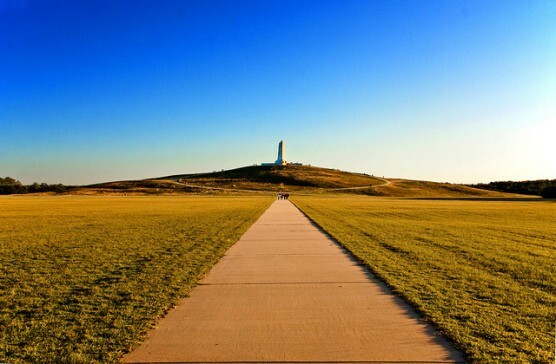 The race will feature a run around the monument that now stands in Kitty Hawk as a testament to what they achieved, as runners will make their way through Wright Brothers Memorial National Park, near the spot where the first flight took place. Following a point-to-point course that starts in nearby Kitty Hawk along Woods Road, runners head south toward the monument by way of the Albemarle Sound and Kitty Hawk Bay, for a stretch that will take them along the shoreline of the bay and where they’re likely to see the herons, egrets and other wildlife that call the Outer Banks home. The first half of the 13.1-mile route unfolds from Kitty Hawk into Kill Devil Hills, and takes runners for a long stretch along Bay Drive, with the water on one side and the coastal homes and neighborhood streets of Kill Devil Hills on the other. Next, the course heads into First Flight Airport and around the Wright Brothers Memorial, followed by stretches past the high school and several neighborhood blocks before heading back onto the roads along the water, as runners head onto Old Soundside Road/Old Nags Head Woods Road. Runners can expect a combination of different types of terrain through the race’s 13.1 miles, from paved roads at the beginning to dirt roads, trails with mulch and some stretches on sand later in the race. Because the race takes place at just about sea level, nearly all of the course is made up of very flat terrain, with the exception of the minor hills runners make their way through near the end of the race, as they’re running through the Nags Head Woods Preserve in the last couple of miles of the half marathon. These last few miles bring a change from the neighborhoods and airfields earlier in the race, as the roughly two-mile stretch through the preserve is run on trails and packed dirt roads. Between miles 12 and 13, the course makes a left turn to head to the race finish line at the YMCA, and takes runners over a narrow dirt trail through the forest. Located along the Outer Banks of North Carolina, roughly 200 miles east of Raleigh and about 85 miles south of Virginia Beach, Va., Kitty Hawk typically sees cool to mild weather in April, a month that has brought record temperatures here as low as 23 degrees (in 1984) and as high as 93 degrees (in 1990). On race day (April 14), the average low is 53°F and the average high is 70°F. See the race route map for the Flying Pirate Half Marathon here. To reserve your spot in the 2019 running of Kitty Hawk’s Flying Pirate Half Marathon or First Flight 5K race, register online at Active.com here. Ever run in the Flying Pirate Half Marathon? Share your impressions here, or post your review in the Comments below.